JIMMY JULES AND THE NUCLEAR SOUL SYSTEM - "Xmas Done Gone Funky"
Jimmy Jules' music career started in 1961 when he recorded "Talk About You" / "Take It Like It Comes" for Atlantic Records. Jimmy moved to Carnival Records in 1967 and recorded "Nothing Will Ever Change (This Love of Mine)" / "Don't Let Yourself Go". 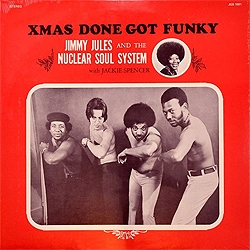 In 1977, Jimmy Jules and The Nuclear Soul System released their EP "Xmas Done Got Funky" featuring Jackie Spencer.